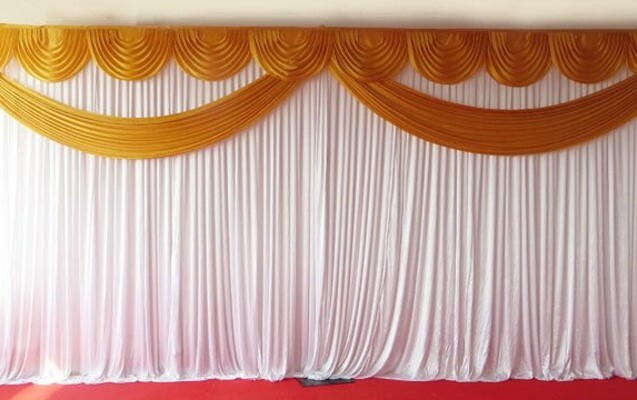 Backdrops and Drapes in Devon, Exeter Newton Abbot, Torquay, Paignton and Plymouth. 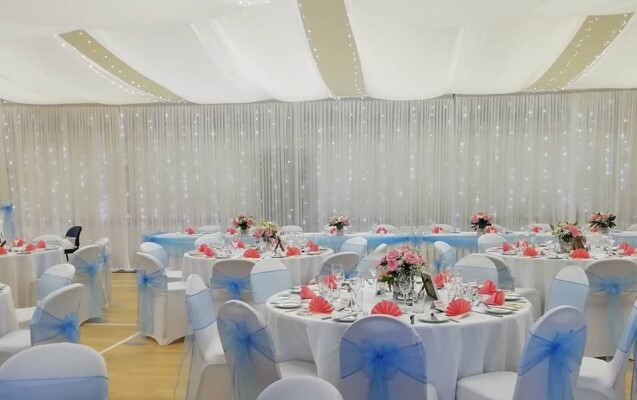 Transform any Hotel Function Room, Marquee, Sports Hall, Village Hall or Barn, into a glamorous romantic setting for your special day with our backdrops and drapes. Add a magical sparkle to your Wedding or Event with our 6m x 3m Sparkle Backdrop, also available in 9m X 3m and 12m X 3m. With twinkling led fairy lights covered by flowing white satin drapes and swags in a choice of colours to create an elegant, fairytale setting. This can add a magical touch behind your top table, enhance a plain or unsightly wall or just add a sparkle to your special occasion. Sparkle Backdrop with Butterfly Swags in a range of colours. 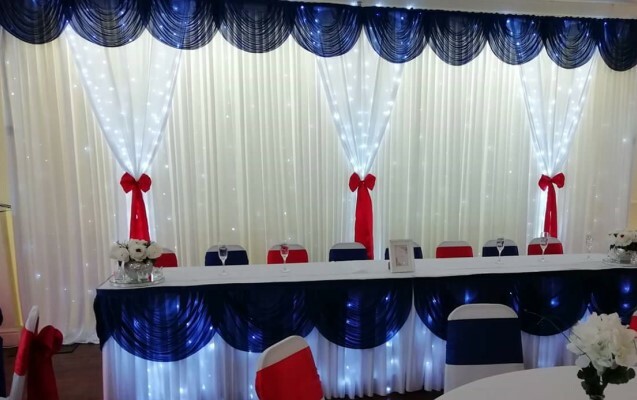 Looking for something a bit different, our spectacular 6m x 3m backdrop and beautiful swags, allows you to put a unique personal touch to your special day. Our butterfly drape is simple, but very elegant, with the white silky swag matching the backdrop or choose a colour from our range. 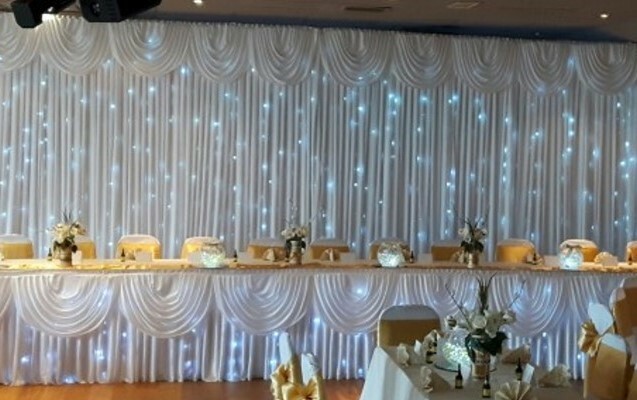 6m x 3m Sparkle backdrop with stunning Grecian style drapes add a touch of luxury. These six silky grecian panels in a choice of colours are perfect if you want something different and glamorous. 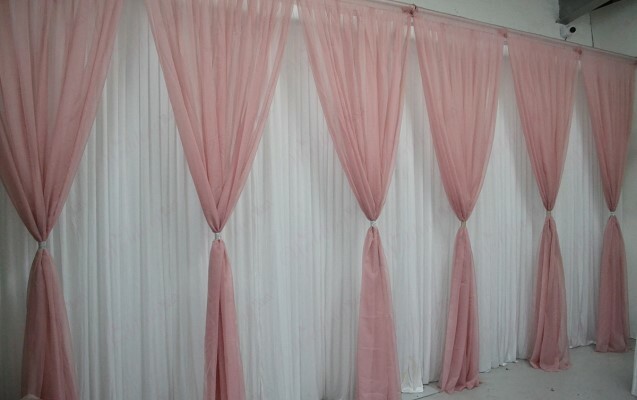 You can have either a bow to match your chairs or a diamante band to tie the drapes together. 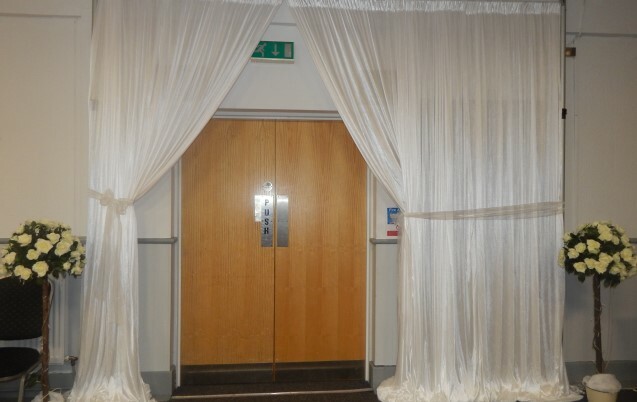 6m x 3m Sparklet backdrop with stunning Grecian style drapes add a touch of luxury. Three white silky grecian panels with lights in are perfect if you want something different and glamorous. For an extra special effect we can offer the top swag in a choice of colours and you can have either a bow to match your chairs or a diamante band. The entrance way to your venue is not just a way in and out, it is an opportunity to set the scene of things to come. Light up the drapes with fairy lights or coloured up lighters to create a magical feel, setting the perfect scene for the evening ahead.